I’m still in disbelief about all of the tragedies going on all over the world. With regard to the United States of America it seems like we have moved back in time with the death of Mike Brown. 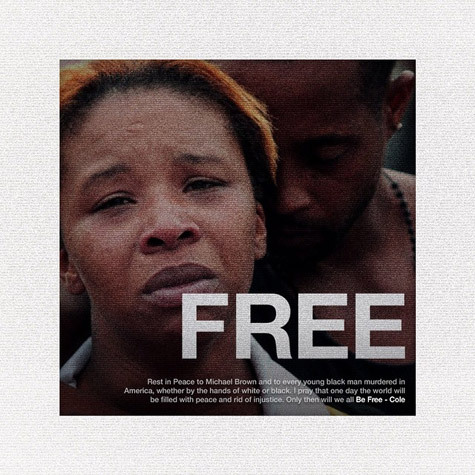 I found the tribute to the young man’s death, by Hip Hop recording artist J. Cole entitled: ‘Be Free’ to be quite profound during this time. On the track the rapper talks about the plight of Black America in a nutshell as it pertains to Black men being killed over senseless reasons by cops all over the country and police brutality in general. I encourage you to listen to this track and share it with someone else. It speaks in volumes and is quite emotional. *s/o to David Banner for standing up and representing Hip-Hop in a major way during this tragedy. His words have been very encouraging and on point about this case. Read more here via Banner’s Twitter page: https://twitter.com/THEREALBANNER.